The Dark Horse RDA has gotten a lot of attention thanks to the fact that it offers additional varieties of airflow options that you won’t find in any other atomizer. The first thing that you will notice when you get the Dark Horse RDA is that it features smooth threads and that it is ready to be used. You won’t need to worry about cleaning the unit before being able to build. There are different options with all the pieces that are available, meaning that you can build your own atomizer to suit your specific requirements. You can choose multiple airflow options, drip tips, as well as screws and this atomizer can be fully customized to suit your own preferences. Here is more about the Dark Horse RDA and its features. The Dark Horse RDA offers over 16 different options for airflow. You can decide how much airflow you want, if you want a small amount, you can restrict it and if you want a lot, you can leave the valves fully open. The AFC features three vertical slots and there are opposite sides and each of them features three different size in each of the sets. There are two large sized rectangular holes at the chamber on the top cap and they are opposite to each other. You will also find three sets of two cyclops slots and they are arranged with two being across one another and the other one on a different size, which allows you to use a single coil build. The AFC (Adjustable Airflow Ring) can be used to adjust the airflow in any dripper, but in the case of the Darkhorse RDA, you can flip the ring over, which is a unique feature. The airflow is cut to all holes in half, which is what gives you 16 different options, although it may seem like the AFC only has 8 options for airflow. With the atomizer is possible to put super wide bore tip on, open the airflow and enjoy amazing clouds of vapor with a lot of airflow. Alternatively, you can place the regular tip on, shut down the airflow and get an incredibly intense flavor experience. In the three post design, the positive post is gold plated and there are only a few options to use the posts. They feature Phillips head screws but you can get the Allen key screws and an Allen wrench that fits without issues. The posts are large (they measure 2.7 mm), which allows you to wire them without major issues. This is an easy to build option that will suit users with no previous experience with rebuildable atomizers. One downside is that the Dark Horse atomizer can’t hold a lot of e-juice so you won’t be able to vape all day without having to refill. When it comes to drip tips, there are two options: the normal sized wide bore tip with coordinating nylon insert and the super wide bore nylon drip tip. 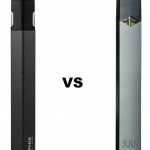 The latter is ideal for higher wattage mods, although it needs a lot of airflow when used with smaller wattage devices. The Dark Horse is made of stainless steel and it is available in a variety of colors including Black, Blue and Rainbow, it comes with gold plated positive posts and square negative posts. The negative posts are milled into the deck and the black nylon heat resistant adapter. You also get a one year limited warranty. 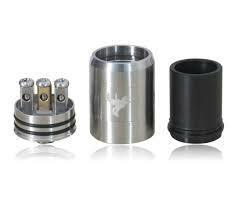 The Dark Horse RDA Clone is made in the United States and it offers high quality materials. It is made in facilities that offer the highest standards of technology, ensuring that you get a product that is made to last and to provide the best possible performance. The manufacturers have invested a lot of time and resources to ensure that you get a high quality atomizer that is not only functional, bit that also has an appealing design. Steam Angel Technology’s attention to detail, have made the Dark Horse one of the most attractive options available and the fact that you can get 16 different airflow configurations makes the unit very unique. In addition, you can change and adjust the airflow configurations as needed, in order to get the right amount of airflow. The Dark Horse also comes with a 510 connection and the threading can be adjusted using a screw, which allows you to fit it to your personal requirements. The flavor that you get when using the Dark Horse RDA is fantastic and you get to enjoy amazing clouds of vapor as well. It can be used with a single coil, double coil and more. It gives you flexibility to build it in the way you prefer. The Dark Horse RDA works well with mods like the Taste MVP 3.0, which offers a great flavor experience, and the Clouper Mini 30w, which is a powerful mod with an internal regulator that offers impressive accuracy. If you are a new vaper, it is not advisable to start with a rebuildable. These units are recommended for experienced vapers. There is some risk involved when using rebuildables so you need to know what you are doing. You require an ohm reader, a multimeter or a mod that can provide accurate resistance readings. It is also important that you know how to use a multimeter/ohm reader in the right way. Rebuildable coils always should be tested with a multimeter/ohm reader prior to use. Not testing them could be very dangerous. A faulty coil can ruin the mods and other devices. You also need to test all wicks and coils before using them. The first time a coil/wick is used, it should be on a device that has short protection. Make sure that you don’t use them if they have not been tested to confirm their safety, otherwise, they could ruin electronic devices. The Dark Horse atomizer is a fantastic solution for users who want an advanced vaping experience that offers intense flavor and amazing cloud production. 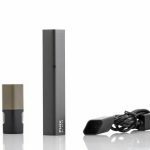 It offers a wide range of options so you can vape according to your own style and needs.